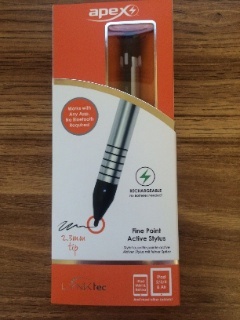 Back in January, LYNKtec introduced its Apex Fine Point Active electronic stylus with an ultra small 2.3 mm tip. Now, the product has been upgraded to a new model with a rechargeable battery. Plus, it's pleasingly longer, includes a pocket clip and has a more durable polymer nib. It's hard to contain my enthusiasm for these electronic styluses from LYNKtec. 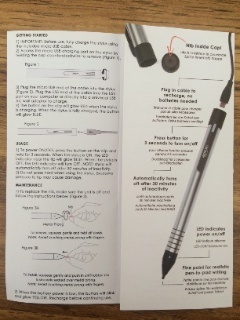 The first release was the Apex Fine Point Active Stylus, and I reviewed it on January 28, 2014. 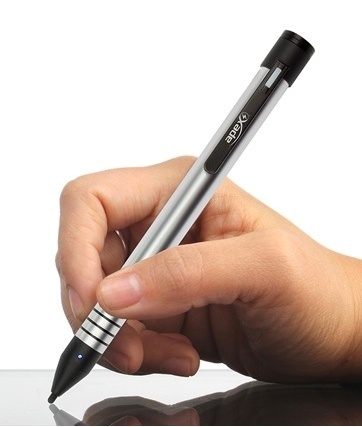 You may want to refer to that review because there was a lot of technology discussion about how this active electronic, non-pressure sensitive, stylus works as well as a discussion of the price for this kind of device. The overall length has grown to a pleasing 6 inches (15 cm.) This was a frequently requested feature by customers and also suits my own historical preference for a stylus that mimics a quality pen in length. A good looking, metal (not plastic) pocket clip is included in this version. The surface texturing no longer shows fingerprints. The brushed aluminum has an even better feel in the hand. The weight has actually gone down, from 32 grams to 28.4 grams compared to the previous model. A more durable, replacement polymer nib is included inside the screw on/off cap that covers the charging port. This model comes in one color only, "satin chrome." 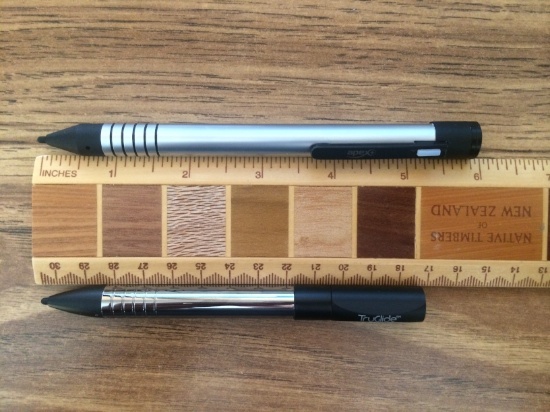 This stylus is rated to work with all Apple iPads and "most other tablets." While it worked with my iPhone 5s, there may be issues with other smartphones or iPhones sold outside the U.S. As a result, this product is really targeted at Apple iPads. Rechargeable model (top) and previous model (bottom). I had some additional questions for LYNKtec about this model, so I'll just quote the Q&A from the emails. 1. What is the rating for the number of charging cycles for the built-in battery? The built-in battery can be recharged over 500 times and as often as necessary. 2. When the battery finally fails, in its normal course of recharge cycles, is there a replacement program? Depending on the user and the amount of use ... the user should get about 20 years worth of use out of the Rechargeable Apex. In the case of a defect, we do offer a 1-Year Limited Warranty. 3. Is a leather holder no longer included? The current model listed at $69.99 does not come with a leather holder. However, we will be adding a new leather holder for the Rechargeable Apex to our product line shortly. 4. Has there been any progress on the iOS & apps front in dealing with the “Wavy Line" effect described in the review of the previous stylus? As a matter of fact, there has. There is now a calibration option for the Apex in the popular note-taking app, ZoomNotes. This feature is accessible in the free (Lite) version of the app as well. We are also continuing to work with other app developers to integrate a calibration setting for the stylus into their apps. 5. What is the expected lifetime of these new nibs, in average use? These new conductive polymer nibs have been improved to be more durable than the previous design, but there are many variables. In regular use, it could be about 2-3 months - but again, that totally depends on the user, how often they use it, how much pressure they use, etc. Replacement nibs are available on our website at US$4.99 for a 5-pack. LYNKtec says that with normal use, a single charge should last two to four weeks. I wasn't able to confirm that during the time I used it. 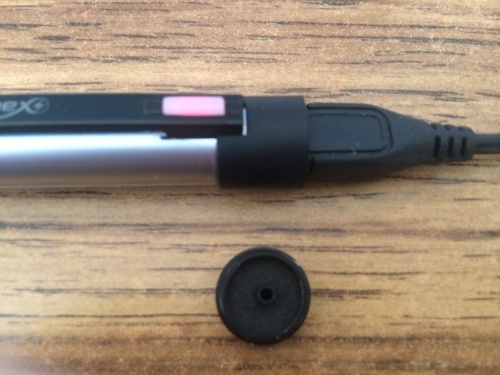 Instead of twisting the top of the stylus to turn it on, as before, there is now an integrated battery status light and button on the pocket clip. (See photo below) Press and hold for three seconds to turn the stylus on or off. A blue LED near the tip indicates the unit is on. Also, this Apex Rechargeable will automatically turn off after 30 minutes of inactivity. charging cable attached, switch and light. As before, there is a ribbed section near the tip that affords a better grip. I have noticed, in my own case, that when using my finger to tap that there is a psychological tendency to wait until the iPad/iPhone responds. However, when using a hard tipped stylus, I had a tendency to release a split second early. Call it a stylus bounce. If this happens to you too, just remember to hold this stylus after a tap until the iOS device responds, just as you'd do with your finger. LYNKtec has created an introductory video that may be helpful. 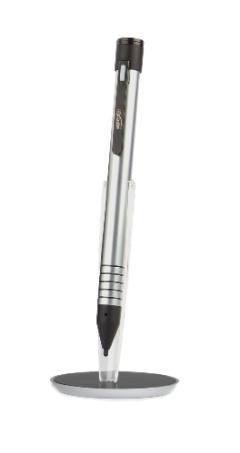 I think that once one uses a stylus like this, it's very hard to go back to an ordinary, non-electronic stylus. That's because few standard styluses 1) feel so good in the hand 2) are long enough and 3) feel so good on the surface of, say, an iPad. It feels like you're using a ballpoint pen on smooth paper, not a mushy stylus. I did some brief testing with ZoomNotes on an iPad Air. 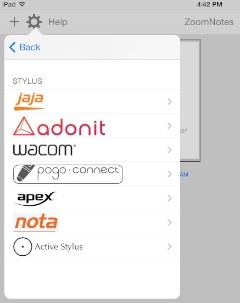 Here are the app's settings for various styluses. ZoomNotes stylus settings include Apex. I tested to see if the "Wavy Line" effect I noticed in the previous review, with a different app, was indeed gone. Here's the result. (1) is the LYNKtec TruGlide Pro, a standard stylus with a microfiber tip and (2) is the Rechargeable Apex. The wavy diagonal lines are indeed gone. 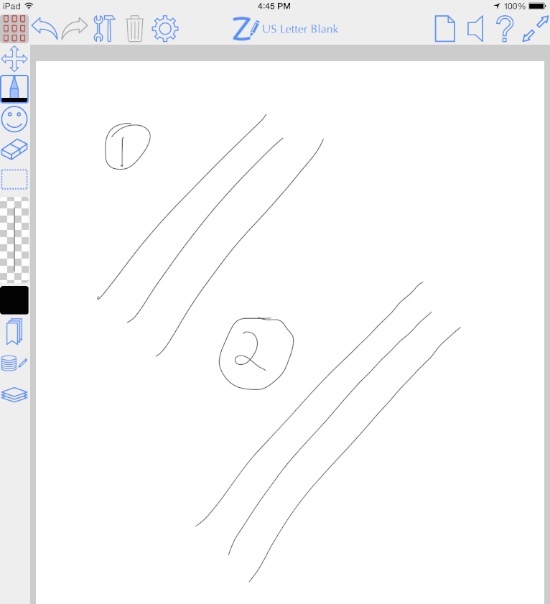 As expected, I also got the same straight diagonal lines with the original Apex stylus because the fix is related to the ZoomNotes software and has nothing to do with the newest (rechargeable) model's electronics. to eliminate wavy diagonal lines. As before, the packaging is nicely designed and easy to open. Inside is the charger cable and a three panel pamphlet. The systems that are supported, the package contents and the warranty are clearly marked on the box. There's a small photo (on the back) of the cable and its connection to the stylus so there's no doubt about how it works with emphasis on the fact that this is not a Bluetooth device. LYNKtec has demonstrated how products should be packaged. The LYNKtex website also has great information to help the prospective customer. The replacement nib fits into the threaded cap that covers the charging port. Not only is that a great way to keep it available, on the go, but it keeps that small part from being lost when one is eagerly tearing open the package after it arrives. folded to show diagram with callouts. The back of the manual has notes for recommended apps, how to get a replacement nib, and how to get help all linked with QR codes. A phone number and email address for customer support is included. LYNKtec is offering a handsome Levitating Stand that makes the Apex Rechargeable or the original Apex appear to be floating in mid air. It's priced at $14.99. I like this Apex Rechargeable even more than the original Apex Fine Point Active Stylus — which has now been reduced in price to $49.99. It has all the fixes both the users and I recommended in the previous version, including, most importantly, not having to keep a supply of AAAA batteries on hand. It's beautifully made and will likely, if you're willing to invest the money, cure you of using the low tech styluses of old, even the excellent LYNKtec TruGlide Pro. Because this product is rechargeable, is amazingly good looking, is great to hold, has a great feel on the glass, has all the features one could want, has an automatic timeout, is beautifully designed, includes a charger cable, includes a spare, more durable nib, has great documentation and support and is everything a modern electronic stylus should be and more, it earns a rare 5/5 rating. Rechargeable lithium-ion battery good for 16 hours of use and charges fully in 90 minutes. Great feel in the hand and surface won't show fingerprints. Is pleasing in length and heft and includes pocket clip. Charger cable, one meter in length, included. Automatic timeout. Low power indicator. Inexpensive replacement nibs available. Great documentation with clearly marked support information. Well designed website. One year warranty.